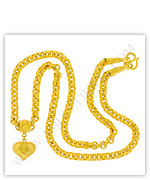 Cheap gold jewelry of this category is ordered from low to high prices. Click on the links or images below for more detail. Cheap gold pendant necklace is shown below.